Green building accounts for about half of the new home construction underway inside the city limits -- 25 certified green homes out of 59 new single family projects. West Asheville is even hotter for green building -- eight of the last 13 home projects that sold and closed in the past six months were certified green. 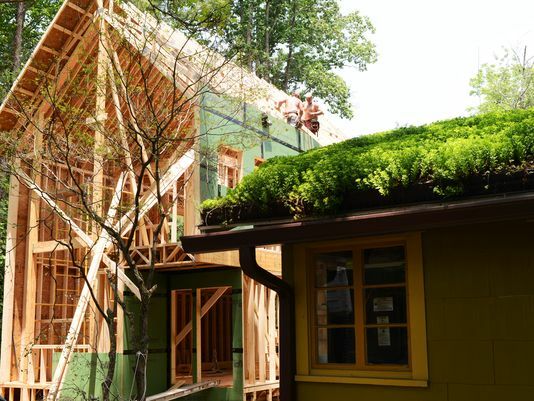 "If you're a builder in West Asheville, you should build it green," said Mary Love, a Realtor for Keller Williams, who chairs the board of the WNC Green Building Council. Green homes are still a fraction of the total Buncombe County market, where some 1,300 homes, mostly existing, are up for sale. But builders, real estate professionals and others are seeing an edge for a home that's certified to be energy-efficient, conserves water, pollutes less into the atmosphere and has better indoor air quality. These homes aren't just advertized as having green features, but are specially inspected and certified along a long checklist that includes technical and specific guidelines requiring more insulation, tighter windows and doors, more efficient heating and cooling systems, even the landscaping outside to prevent runoff. "Going green makes it a lot easier to sell. Green used to be a special category. At this point, you're at a disadvantage if you don't build green," said Mike Figura of Mosaic Community Lifestyle Realty and board treasurer for the Green Building Council. "But green building held its value better, and many consumers saw it as a hedge against another downturn, even though they were paying a little more upfront," he said. Asheville's reputation for green homes extends nationwide. Love hears Asheville mentioned in the top five cities like Austin, Texas, and Portland, Ore., where green homes have gone mainstream in the housing market. "West Asheville is teaching Asheville about green, and Asheville has embraced it. Asheville is going to teach the rest of the Southeast, Charlotte and Charleston and Florida," Boren said. "Green is going to be the norm for all new construction in the next 10 years." Boren got his start as a builder in Charleston, S.C., often working on high-end custom homes in the Low Country and in Florida. Over the past 25 years, he's built about 100 structures, but he decided to change his focus when he moved to Asheville about five years ago. With his Green Earth Developments, Boren has about 18 green projects ongoing around Asheville. He's working closely with building contractor Beach Hensley, who's gone exclusively green in his construction in the past decade. "We're seeing a demographic who are seeking it out. They are looking not just to save on their utility bills, but they like the satisfaction of helping the planet," Boren said on the porch of an unusually green cottage he remodeled on Norbeth Avenue. Next door, Hensley's workers are framing up another home for Boren, tucking a well-designed home on a footprint to save some mature hardwoods. Boren doesn't see much point in clear-cutting a lot to then put a green home. That green sensibility extends not just in the house, but the whole construction process. Boren runs his trucks on compressed natural gas, trying to cut down on his carbon footprint. "It's part of our responsibility," he said. For Hensley, "sensibly crafted homes" makes more sense as a tag-line as green becomes more common and building codes require higher grade insulation and less duct leakage. And more consumers are seeing "green" as synonymous with "quality," since most green homes will boast granite counter tops and tile in the kitchen, hardwood flooring and other amenities. While many designs will incorporate passive solar features such as windows and skylights for heating and light, green homes don't necessarily feature solar power. Tax credits go to homeowners rather than builders who leave it to a buyer to add solar panels. A green home means smarter construction with higher insulation and tighter envelopes that keep heat from escaping the house in winter, or cooler air in summer, while letting in ample fresh air and plenty of light. There's also a focus on building materials that aren't toxic or omit any noxious smells or chemicals. "The main reason for people to buy green is the energy efficiency, but there are a lot of buyers 50 years and up who are looking for better indoor air quality," Love said. Green can cover a range of architectural styles from modern to more traditional arts and crafts. Hensley's finding a ready market for homes prices at $350, 000 up to $500,000. But as more people want a green home in an Asheville neighborhood, demand is not keeping up and prices are starting to rise. "It's hard to find a green home for $350,000" Figura said. "Green is not a fad. It's here's to stay in Asheville." 85 percent of the state's Green Built certifications are in Western North Carolina. Search all Green homes for sale in Asheville, NC here. It's in fact very complicated in this active life to listen news on Television, thus I simply use world wide web for that purpose, and take the most up-to-date information. Right here is the perfect webpage for anybody who really wants to find out about this topic. You know a whole lot its almost hard to argue with you (not that I actually will need toâ€¦HaHa). You definitely put a new spin on a topic that's been discussed for ages. Excellent stuff, just wonderful!